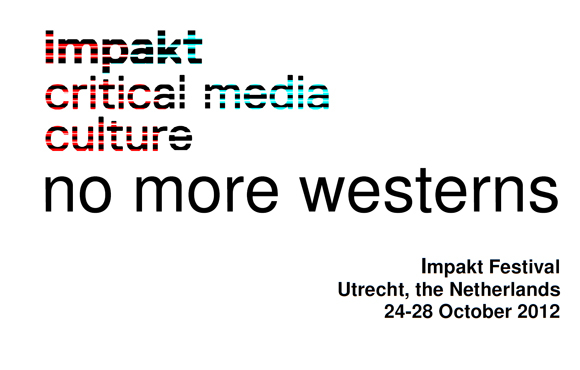 Impakt, foundation for critical media culture in Utrecht (NL), invites interested parties to submit curatorial proposals for the Impakt Festival 2012, which takes place from 24 to 28 October, focussing on the theme No More Westerns. The Impakt Festival is the annual culmination of Impakt’s activities as a foundation specialising in critical media culture: a multi-medial festival with conferences, readings, performances, screenings, exhibitions, and music. The curatorial proposal can be submitted by curators individually or collectively and should revolve around this year’s theme, No More Westerns: the changing image culture under the influence of geo-political changes worldwide. We expect curator(s) to present a clear vision on the relations between economic developments, media industry, image culture, cultural identity, and contemporary iconography in order to investigate and analyse future developments by means of the programs presented at the Impakt Festival 2012. The festival program should sketch out subjective long-term prospects of the media culture and the ways this culture may develop in decades to come. These developments should also contain links between the current-day situation and the situation in the past, especially in respect to the emerging economies of, for instance, the BRIC countries. Ideally, the curator or the curatorial team can be responsible for the entire festival program comprising films, lectures, new media projects, presentation, a music program, and an exhibition. Another possibility is to submit a proposal for one or some of the parts of the festival program. Depending on the response of the potential candidates, Impakt may choose to work with an overall proposal of one curator or a team of curators, or to bring several curators together and compile a combination of different proposals. For more details about the No More Westerns theme, we refer you to the text on our website. There is a budget for compiling the program including artists and screening fees, travelling and accommodation expenses, technical and building overhead. Curators will be paid a fee and receive a research budget. Following a first selection of the proposals submitted, the curators in question will be contacted about the financial details. An overall concept clarifying the approach of, and connection to the No More Westerns theme. An introduction to the various parts of the program including an overview of the artists featured in the various programs and a short explanation of the choices made in this respect. Documentation of some of the more prominently featured artists, containing links to portfolios, writings, videos, resumes, etc. A clear indication of the program parts compiled by the curator, and, if applicable, a description of the program parts for which the main curator chooses to work with external curators (including resumes). If a curator chooses to submit a concept for a separate part of the program instead of an overall proposal, we expect to receive a clear indication of any uncovered program parts, that is, program parts for which Impakt is expected to find other curators. Resumes of the curator (or all curators in the team).